The GE LightSpeed VCT is a whole body CT scanner that has been designed to produce advanced cardiac and neuro imaging using SnapShot Pulse™. 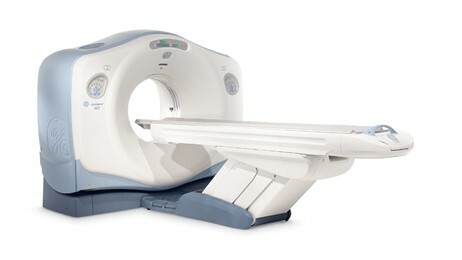 This scanner also uses the VolumeShuttle™ acquisition technique to enable 80 mm of volume coverage. This system was the industry’s first CT scanner to maintain outstanding image quality while reducing the patient’s radiation exposure up to 70%. The GE VCT 64 can capture images of a beating heart in five heartbeats or an organ in a second, and can perform whole body trauma in ten seconds, more than twice as fast as conventional multi-slice CT scanners. It does so without sacrificing clarity – it’s sub-millimeter resolution offers spectacular views of veins and arteries. For physicians, volume coverage means new diagnostic power, including the ability to routinely perform CT angiography, rapid tests for ER stroke and chest pain, and whole body trauma. V-RES™ detector making Volume CT imaging possible. Performix® Pro X-Ray tube meets the unprecedented demands on X-Ray sources with industry leading image quality, peak power and total throughput. Volara™ digital DAS (Data Acquisition System) delivers high processing power for high quality images and low dose performance. Xtream™ FX workflow solution delivers accelerated reconstruction speed, image quality and flexibility enabling optimized volumetric workflow solutions from acquisition to final.